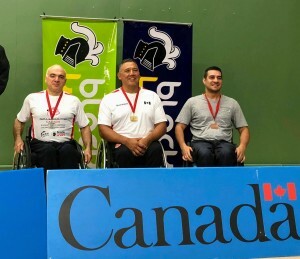 Para-Badminton Nationals were held at the Vancouver Lawn, Tennis, and Badminton Club September 5-8, 2018 for the second year in a row. There are six sport classes in Para-Badminton. Two wheelchair classes (WH1 & WH2), two standing classes (SL3 & SL4), one standing class for upper limb impairment (SU5) and one class for short stature athletes (SS6). This was my first year as a participant in the Wheelchair 1 class. WH1, WH2, and SL3 play half-court lengthwise in singles, full court in doubles and full court in mixed doubles. SL4, SU5 and SS6 play full-court in singles, doubles, and mixed doubles. For the two wheelchair classes, those in the WH1 class have impairment in both lower limbs and trunk, where those in the WH2 class have minimal or no impairment in the trunk and generally have impairment in one or both lower limbs. This goes without saying, but those in the WH2 class would have more function and mobility than WH1 to cover the badminton court and play at a higher level. WH2 athletes move quicker than WH1 and hold their chairs less for balance. Athletes in the WH2 class would have lower spinal cord injuries than those in the WH1 class. You may also see single or double leg amputees in the WH2 class. The rest of the para classes are for the standing athletes. SL3 athletes have impairment in one or both lower limbs and have poor walking and running ability. This class sees athletes with cerebral palsy, bilateral polio or loss of both legs below the knee. The SL4 athletes usually have impairment in one or both lower limbs, but can run faster than SL3 athletes. SL4 athletes may have unilateral polio or mild cerebral palsy. The SU5 athletes have impairment in their upper limbs only. This could include athletes with missing fingers, missing arm, or nerve damage in one arm. SS6 athletes are of short stature, but their games are not short on entertainment. While this was my first Para-Badminton Nationals, this was not the first time I have met the same competition on courts of different sorts. Players like Richard Peter, who played wheelchair basketball on the national team winning gold in London 2012, and Misha Bilenkey, my former neighbour and BC wheelchair tennis champion, who were both in my WH1 class. While I had great games hard fought competitions against all opposing players, I wheeled home with the bronze medal for finishing in 3rd place, which is not too shabby considering this was my first national badminton competition.